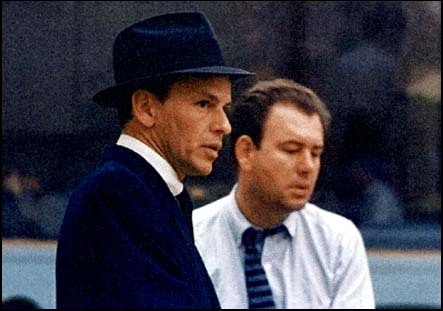 On November 15, 1956, Sinatra and Riddle returned to the studio to record their sequel to the year's earlier Songs for Swingin' Lovers, A Swingin' Affair (Capitol). On November 26, on one of the final nights of the session, they recorded "Night and Day", a Riddle arrangement that strongly resembled "I've Got You Under My Skin". Sinatra had recorded "Night and Day" before, an Alex Stordahl version, and then again later in 1961, a 3rd version arranged by Don Costa that is perhaps best known after appearing on Sinatra Reprise: The Very Good Years (a bit of a regrettable greatest hits album since most of his best recordings were on Capitol). Riddle's arrangement tops them all with his typical big exuberant charge. Sinatra used it, for example, in his top form 1959 Australian concert. But, especially when touring without a full big band, he reverted to versions more similar to the ballad arrangements. One example is from the Royal Festival Hall concert in London on June 1, 1962. Here with the Bill Miller Sextet, he abandons the 3 arrangements entirely and performs a duet with guitarist Al Viola. (Sinatra and Viola performed a very similar version in the widely available Sinatra and Sextet: Live In Paris from his Paris debut 4 days later, but Viola's dynamics in the London version tops that one in my opinion). At some point in later 2014, early 2015, I'll post a full transcription for guitar of Nelson Riddle's arrangement. Here I include the intro from the Al Viola live duet. Riddle's version jumps right into the verse ("Night and day... you are the one"), skipping the monotonic intro ("Like the beat, beat, beat..."). The Riddle recording maintains its tempo and bombast by doing that, but loses the obsessive discordant lead in. So adding the Viola intro to the Riddle score gives us the best of the aggregate Sinatra performances. The intro is mostly a D chord but the vocal line is monotonically A (the 5th). When the singer rises to B and then C ("Like the drip drip drip"), the chords move behind him too, largely keeping him on the 5th (e.g. "raindrops") or 6th ("is through", a Bb over Db chord). It never resolves to the A chord in the intro; the song remains unfinished until the very end. This version was recorded a Variax 1961 Gibson ES-335 (Semi), middle pickup position, through a 1964 Fender Deluxe Reverb (1964 Lux) with a lot of warm plate reverb. Acoustic is a also from the Variax, acoustic/bridge pickup, a 1959 Martin D-28. In contrast with the other Sinatra tabs and recordings, which took months each, this one was done in a few hours over 2 nights using Celemony's Melodyne singletrack to determine the guitar chords. All text copyright © 2014 Tim Darling.